Each year, U.S. News & World Report™ evaluates thousands of hospitals located throughout the United States. For 2017-2018, NewYork-Presbyterian Brooklyn Methodist Hospital was named a Best Regional Hospital and achieved the highest rating possible in three conditions/procedures: chronic obstructive pulmonary disease (COPD), colon cancer and heart failure. NYP Brooklyn Methodist was also recognized as "high performing" in the specialty of neurology/neurosurgery. Find more information about 2017-18 Best Hospitals here. NYP Brooklyn Methodist Hospital has the Joint Commission Gold Seal of approval. View our Joint Commission ratings here. 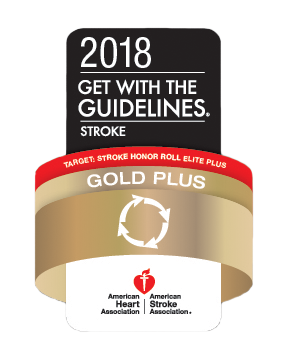 Our stroke program has earned the American Heart Association/American Stroke Association Get With The Guidelines®-Stroke Gold Plus award as well as a spot on the Target: Stroke Honor Roll Elite Plus. The Commission on Cancer (CoC), a quality program of the American College of Surgeons (ACS) granted Three-Year Accreditation to the cancer program at NewYork-Presbyterian Brooklyn Methodist Hospital. To earn voluntary CoC accreditation, a cancer program must meet 34 CoC quality care standards, be evaluated every three years through a survey process, and maintain levels of excellence in the delivery of comprehensive patient-centered care. Learn more about the award here. NewYork-Presbyterian Brooklyn Methodist Hospital has earned the “Leader in LGBTQ Healthcare Equality” designation from the Human Rights Campaign Foundation (HRC), the educational arm of the nation’s largest lesbian, gay, bisexual, transgender and queer (LGBTQ) civil rights organization. The designation was awarded in the 11th edition of the Healthcare Equality Index (HEI). Nationwide, only 418 healthcare providers earned the "Leader in LGBTQ Healthcare Equality" designation. Learn more about this designation here. For the eighth time, NewYork-Presbyterian Brooklyn Methodist Hospital was named a "Consumer Choice Award Winner" by the National Research Corporation. The Consumer Choice Award identifies the top hospitals that healthcare consumers have chosen as having the highest quality and image in markets throughout the U.S. Winners are determined by consumer perceptions on multiple quality and image ratings collected in the company's Market Insights survey. Learn more about the Consumer Choice Awards and view the 2015-2016 winners here. NewYork-Presbyterian Brooklyn Methodist Hospital was listed for the second consecutive year as one of the "100 SafeCare Hospitals" by the SafeCare Group. The SafeCare Group made its selection for SafeCare hospitals based on the Triple Aims of Excellence in healthcare - Quality, Patient Safety and Efficiency of Care. The process was comprehensive with analysis of data from over 4,500 hospitals, throughout the United States, in over 30 measures. Only the top 100 best hospitals were selected. Learn more about the award and the SafeCare group here. NYP Brooklyn Methodist has been designated a "Breast Imaging Center of Excellence" by the American College of Radiology (ACR), making it one of only two hospitals in Brooklyn to receive this prestigious honor. Read the press release about the Breast Imaging Center of Excellence designation here. The Diabetes Education and Resource Center at NewYork-Presbyterian Brooklyn Methodist Hospital has been recognized by the American Diabetes Association as meeting the National Standards for Diabetes Self Management Education and Support. Learn more about the ADA Education Recognition Program here. NewYork-Presbyterian Brooklyn Methodist Hospital is accredited by the American College of Surgeons, the American Medical Association and the Association for Clinical Pastoral Education. NewYork-Presbyterian Brooklyn Methodist Hospital was recently certified by the Healthcare Information and Management Systems Society (HIMSS) as an Electronic Medical Record Adoption Stage 7 IT Hospital. This is a distinction shared by fewer than five percent of hospitals around the country. Read the press release about this distinction here. NewYork-Presbyterian Brooklyn Methodist Hospital received a Spring 2015 Silver Digital Health Award for our Facebook Page. Learn more about the Digital Health Awards here.